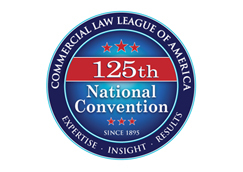 The Commercial Law League of America is the national association supporting and advocating for the interests of professionals practicing in commercial law. Your contribution to the Commercial Law League of America Political Action Committee (CLLA PAC) is a crucial part of our participation in the political process. Uses the funds to support candidates for the United States Senate and House of Representatives who help promote the CLLA’s legislative issues; including, but not limited to: bankruptcy and insolvency issues, the Fair Debt Collection Practices Act and commercial collections issues, and privacy. Contributions are NOT tax deductible and will be used for political purposes. Contributions to CLLA PAC are voluntary and you have the right to refuse to contribute without fear of reprisal. Federal law requires us to make our best efforts to collect and report the name, mailing address, occupation and employer for individuals whose contributions exceed $200 in a calendar year. To contribute by check, make your check payable to CLLA PAC. The check must be drawn on your personal account or on a partnership account. If paying by credit card, the credit card may be your personal credit card or the credit card of a business entity listed above. If paying by check drawn on a partnership or limited liability company account or using a credit card other than a personal credit card, you must provide the allocations of the contribution among the partners if the contribution is not to be attributed 100% to you. In addition, each partner must provide his/her address, employer and occupation, and check the box to confirm the required information. A suggested contribution to the PAC is $1,000; other amounts (either more or less), up to the federal limit of $5000 per person, will be gratefully accepted. Thank you very much for considering contributing to your Political Action Committee — and helping to ensure a positive future for the commercial law and bankruptcy industry.